Old timers will get what I mean. (although later they started doing it again because there was a quadratic solver sub-folder). But there was also a sub-folder just for Pokémon text-based clones, Dragon Ball text-based clones, Pokémon clones with graphics and Dragon Ball clones with graphics. Somehow this sort of reminds me of one time during the first week of June 2011 where one person suddenly uploaded something like 300-400 files to ticalc.org, all at once and without warning. We had to order an emergency evacuation I think it took me about a week or two to finish processing them. 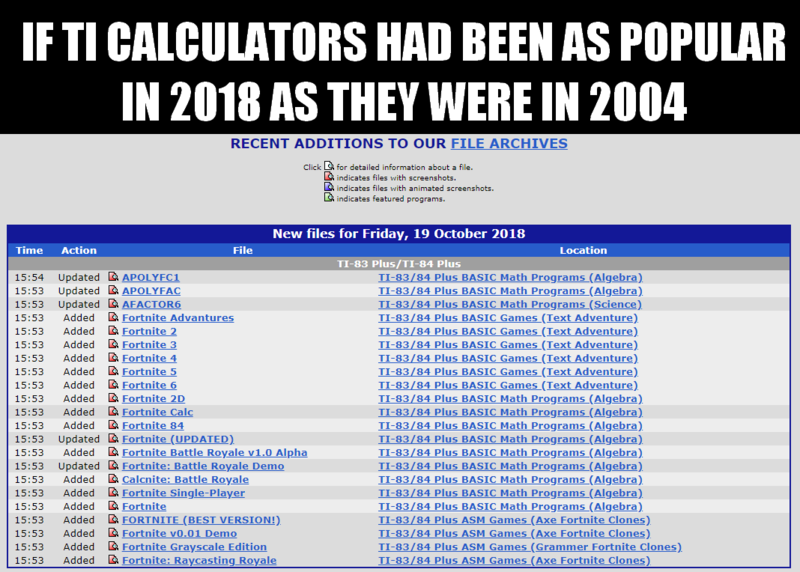 It turned out that over 2/3 of the files were actually duplicates, though, uploaded separately for each compatible calculator, because the uploader didn't know about requesting links. I finally emailed him and let him know about it so he wouldn't have to spend his life filling out three times more upload forms than he had to, haha. Fun times. Although this is a lot of files, the fact it took up to two weeks to process them reminded me about how archeological the ticalc.org "admin panel" is. Although I have never seen it myself, I often heard that it was essentially command console-based. Yeah, the main file processing program is an ncurses terminal app and looks something like this. Then there's a completely separate web-based admin section for managing screenshots, comments, and miscellaneous things. The most amazingly exciting part of processing pending files is having to wait 15 seconds for the antivirus thing to run first--even if there are 0 files in the pending queue to actually scan. On a more serious note, pending files aren't that bad because in most cases they don't take much longer to approve/reject than it takes me to take a quick look to see if they seem okay. Occasionally things get more complicated like if someone gave the file a name that already exists in the archive. The real pain is moving files. With the "fa" tool, it has to be done one at a time, and if the file has any links it can't be moved at all (unless you manually write down all the links, remove them, move the file, then recreate all the links again, one by one). I eventually got so sick of that that once I learned enough about how the DB backend and fa worked I started writing my own scripts on the server to be able to move groups of files at once, even linked ones.